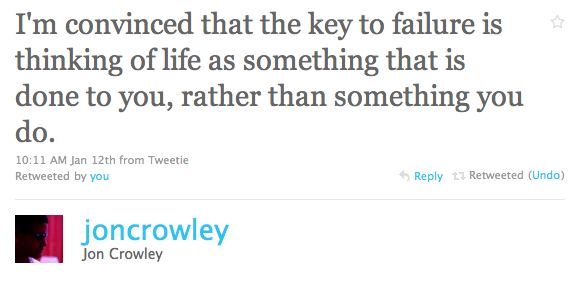 @joncrowley: "I'm convinced that the key to failure is thinking of life as something that is done to you, rather than something you do." It’s easy — comfortable, even! — to feel like you are stuck in a rut, a victim of circumstances that prevent you from being truly awesome, but it’s simply not true: you are always in control. You can’t ensure the outcome of every endeavour you undertake, but you choose your actions, your reactions, your thoughts, and your words. Even though you command all of these things, you may still feel like you are burdened by obligation or paralyzed by fear. Take the reins. Steer your life in the direction of your desires. Work hard to achieve those things which are most important to you as you cut away those things which bring you down. Don’t let life just happen to you. Your life is finite and fleeting. Be present and engaged in every single moment and wring out every bit of joy and excitement that you can. Unless you have a very strong belief in life after death, this time which is steadily elapsing is all you’ve got. Even if you do have faith, why waste time? That’s what I think anyway, but it’s your call. This entry was posted on at 10:51 pm	and is filed under Personal Development.